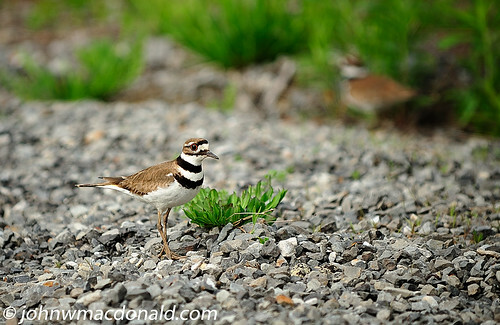 Killdeer (Charadrius vociferous), originally uploaded by johnwmacdonald. A Killdeer, a ringed plover, watches over its 'nest', basically a shallow depression in the gravel. There's another Killdeer mate in the background. I'll let you find the four well-camouflaged eggs. "When a nest is approached, the adult feigns injury, hobbling along with wings dragging as if badly wounded. This behaviour usually succeeds in luring a predator away from the eggs or young; the bird then "recovers" and flies off, calling loudly. "kill-deee, kill-deee, dee-dee-dee".